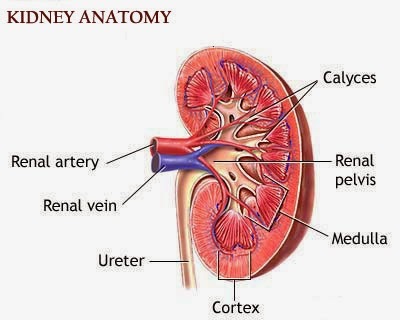 Nursing Care Plans for Kidney Cancer, kidney cancer is rare, kidney cancer also called nephrocarcinoma; renal carcinoma, hypernephroma, and Grawitz’s tumor originate in the kidneys. Others are metastases from various primary-site carcinomas. Kidney cancers are classified by cell type. The three most commonly seen in the adult are renal cell carcinoma, transitional cell carcinoma, and sarcoma. Most kidney tumors are large, firm, nodular, encapsulated, unilateral, and solitary. They may affect either kidney; occasionally they’re bilateral or multifocal. Kidney cancer is twice as common in males as in females; it typically strikes after age 40. Kidney cancer can be separated histologically into clear cell, granular cell, and spindle cell types. Sometimes the prognosis is considered better for the clear cell type than for the other types; in general, however, the prognosis depends more on the cancer’s stage than on its type. GI problems from liver metastasis. The patient may complain of hematuria and often a dull, aching flank pain. He may also report weight loss, although this is uncommon. Rarely, his temperature may be elevated. Palpation may reveal a smooth, firm, nontender abdominal mass. Identify strategies to reduce anxiety. Express fears and concerns relating to his condition and prognosis. Maintain joint mobility and range of motion. Communicate understanding of medical regimen, medications, diet, and activity restrictions. Before surgery, assure the patient that the body will adequately adapt to the loss of a kidney. Administer prescribed analgesics as necessary. Provide comfort measures, such as positioning and distractions, to help the patient cope with discomfort. After surgery, encourage diaphragmatic breathing and coughing. Assist the patient with leg exercises, and turn him every 2 hours to reduce the risk of phlebitis. Check dressings often for excessive bleeding. Watch for signs of internal bleeding, such as restlessness, sweating, and increased pulse rate. Position the patient on the operative side to allow the pressure of adjacent organs to fill the dead space at the operative site, improving dependent drainage. If possible, assist the patient with walking within 24 hours of surgery. Provide adequate fluid intake, and monitor intake and output. Monitor laboratory test results for anemia, polycythemia, and abnormal blood chemistry values that may point to bone or hepatic involvement or may result from radiation therapy or chemotherapy Provide symptomatic treatment for adverse effects of chemotherapeutic drugs. Encourage the patient to express his anxieties and fears, and remain with him during periods of severe stress and anxiety. Tell the patient what to expect from surgery and other treatments. Before surgery, teach diaphragmatic breathing and effective coughing techniques, such as how to splint the incision Be sure the patient understands what medications are to be taken at home, their effects, and dosages. Explain follow-up information, such as when the physician would like to see the patient. Provide and arrange for a home visit from nurses if appropriate. Refer the patient and family to hospital and community services such as support groups Reinforce any postoperative restrictions. Explain when normal activity can be resumed. Make sure the patient understands the need to have ongoing monitoring of the disease. Annual chest x-rays and routine IVPs are recommended to check for other tumors. Emphasize and give understanding of the lifestyle choices that can aid in recovery e.g. Quit smoking, limit alcohol, eat more fruits, vegetables, and whole grains and less animal fat; exercise once you are able. Explain the possible adverse effects of radiation and drug therapy. Advise the patient how to prevent and minimize these problems. When preparing the patient for discharge, stress the importance of compliance with prescribed outpatient treatment.